'Blackboard' Chalks A Nostalgic Portrait Of School Days Lewis Buzbee's account of his idyllic youth in the California public school system is relentlessly positive, though bracketed with criticism of current school policy and a firm call for more funding. Nostalgia is a hard-hitting drug, its alchemical powers well known, but can it turn a child's entire school experience into sentimental gold? Some kids love school, and many, in retrospect, realize that what seemed like misery at the time was actually relative joy compared to what came after. But to find a silver lining in even the most embarrassing, most angst-filled moments of your school years? 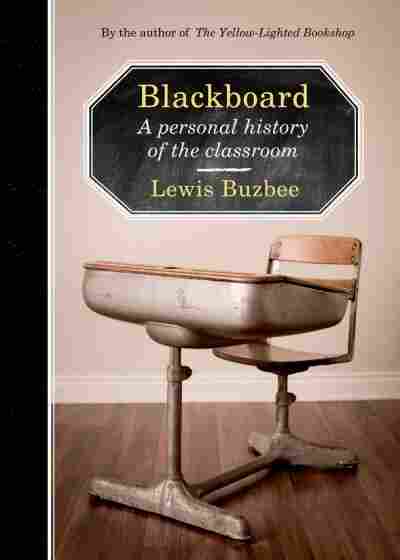 Such a thing seemed impossible for even the most wistful of people, until I read Lewis Buzbee's Blackboard: A Personal History of the Classroom. The "personal" in the title is key. Buzbee briefly explores the changes in school designs and teaching tools as education became mandatory and widespread in the 20th century. He also sketchily tackles policy, bemoaning the current state of public education in California and bookending Blackboard with firm calls for drastic increases in school funding. But Blackboard serves mostly as a memoir of Buzbee's idyllic time in California's public education system. Beginning in the early '60s at Bagby Elementary School and onward through to college, this is a thoroughly romanticized account, with the smallest details of the school day turned into momentous events. For Buzbee, even the task of cleaning blackboard erasers becomes a chance to watch "the words and number and ideas from the previous week as they drifted out over the playground." There are some darker moments, in particular the sections describing the death of Buzbee's father, who passed away when Buzbee was only 12. Yet even here, discussing an experience that he says "opened up for me a bottomless absence that has never completely filled," Buzbee steers away from his own pain. Instead, he uses the experience to explain how school — and in particular a group of attentive teachers — saved him from continuing down a path leading to drugs and incarceration by making sure that he shifted his attention back to school. That positive outlook feels particularly incomplete because of a larger issue: Blackboard's relatively short length compared to its long timespan – which means that while Buzbee's anecdotes are imbued with magic and wonder, they're also unfortunately generic. At times, he resorts to lavish language to embellish a commonplace event: "Bagby's clocks," he writes, "did not progress gradually but discretely, clicking audibly to the next minute only when the second hand had mowed through the round field of time." More often, he simply fails to offer anything more than basic insights and observations. Buzbee loved the drama club because it involved "a lot of work, a whole bunch of fun, and some valuable lessons snuck in as well." Physical education is an important part of the curriculum, he argues, because "to be made to go outside and run laps can be as energizing for the mind as for the body." The same lack of specificity weakens his brief forays into history, which would have added a welcome layer of context to the personal stories — had they not attempted to relay several centuries' worth of ideas in a few pages. Blackboard is most compelling when Buzbee does go into detail — like when he transcribes a forged absence note from the fifth grade that he signed "Lewis' dad, Mr. Buzbee." But these moments offer a new hurdle for some readers: Buzbee's discussions of a particular exercise book he used at Bagby and his defense of metal lunchboxes open up a generational divide. Those who are several decades younger than Buzbee (like me) will find it hard to use his memories to spark their own, to appreciate his references to midcentury pop cultural figures like Daniel Boone or Gomer Pyle, or share his lament for the replacement of blackboards with whiteboards in today's classrooms. That's not a total knock against Buzbee. I can also imagine many readers who will gladly follow him on his journey. But Blackboard's fond remembrance of times past does undercut Buzbee's argument concerning the current quality of public education, with which he begins and ends the book. The larger purpose of Buzbee's personal history is to compare how good he and other California public school students of his age had it compared to kids today, and to therefore call for a substantial increase in government funding for public education. The effect is much like hearing a wealthy politician call for redistribution of wealth in a speech where he also lists all the glorious things money can buy. The intentions are good, the demanded action necessary and laudable, but the approach is misconceived. Tomas Hachard is an assistant editor at Guernica Magazine and a film and book critic for NPR and The LA Review of Books.